FAB SUPPORT AB has chosen to work with SAES Pure Gas products, the largest global supplier of bulk and point-of-use gas purifiers for a wide range of gases. 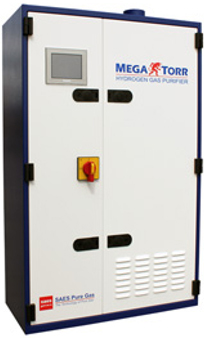 MicroTorr Purifiers can be tailored to many different customer applications, by combining the model size with a selection of gas-specific purification materials. Optional features include an ultrafine 0.003µm particle filter, inlet/outlet valves, bypass assemblies or custom manifold assemblies. SAES Pure Gas MonoTorr heated getter purifiers are ideal solutions for point-of-use purification where CH4 or N2 removal is required. Getter technology allows irreversible chemical absorption of impurities to sub-ppb levels. 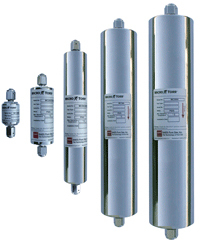 Five different sizes are available for flow rates from 1 sccm to 150 slpm. SAES Pure Gas offers an entire line of bulk gas purifiers designed for complete facility-level purification. 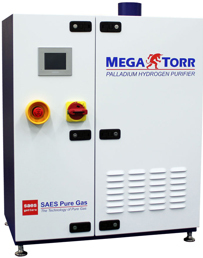 SAES Pure Gas Palladium Hydrogen Purifiers produce the purest hydrogen on the planet. Only hydrogen is able to pass through the palladium membrane, while all other impurities travel out the bleed line. This patented micro-channel palladium membrane technology removes all impurities to below partper-billion (ppb) levels. 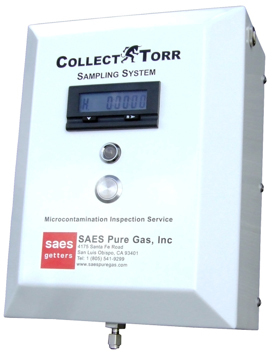 The AMC Sampling Service from SAES Pure Gas is an economical way to determine molecular contamination in Nitrogen, Carbon Dioxide, CDA or Cleanroom Air. Detection limits are low Part-Per-Trillion (pptV) for Acids, Bases, Organics, or Refractory Compounds. Please contact us for assistance in choosing the right purifier for your needs.